Total subsidies for renewable energy stood at $66 billion in 2010 – less than one-tenth of the government financing provided globally to the fossil fuel industry, according to new research from the Washington, DC-based Worldwatch Institute. 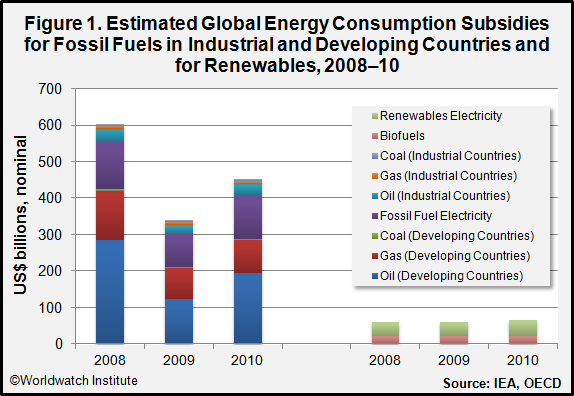 for “decarbonizing” the global energy system. Such a shift could help create a triple win for national economies by reducing global greenhouse gas emissions, generating long-term economic growth and reducing dependence on energy imports. 2009 pledge by the Group of 20 major economies to reduce “inefficient fossil fuel subsidies” has been left “vague and unfulfilled.” The lack of a definition has left countries to make their own determination if their subsidies are inefficient. As of August 2012, G20 countries had not taken any substantial action in response to the pledge: Six members opted out of reporting altogether (an increase from two in 2010), and no country has yet initiated a subsidy reform in response to the pledge. WASHINGTON, May 30 (IPS) – If a series of “golden rules” can be followed, a new report from the International Energy Agency (IEA) suggests, global natural gas usage could grow by more than 50 percent by 2035.The report, released on Tuesday, came under sharp criticism from environmental groups for charting a route to a “golden age” in the extraction and use of natural gas. “We have an opportunity for natural gas to address the intermittency problems of renewable energy sources – it could become an ally of renewables,” Alexander Ochs, the director of the climate and energy programme at the Worldwatch Institute here in Washington, told IPS. Ochs also reviewed a draft of the IEA report. Ochs says that there are a number of actors within the gas sector that will welcome the new IEA recommendations as a way of cutting down on the potential of a future environmental catastrophe that could lead to industry-damaging policy restrictions. Ochs does warn that the report underplays the potential use of renewables in the upcoming decades, however, by suggesting that green technologies other than hydro will only make up five percent of total energy demand in the next quarter century. “I think the IEA could well be wrong in the numbers it’s using. Technically and economically, more than half of our electricity could come from renewables as early as 2030,” he says.